The odometer disclosure statement is a form that is required attachment to a Vehicle Bill of Sale at the time of purchase for all vehicles below 16,000 pounds and under 10 years of age. The document is required by federal law in all 50 States to be filed in order for the finalization of the sale and allows the buyer of the vehicle to apply for registration (along with the Title and Bill of Sale and any other required forms). This is the federal form although your State may have their own Odometer Disclosure Statement that is provided by the Department of Motor Vehicles (DMV). The second blank space requires the Number of Miles, rounded to the nearest tenth, displayed on the Vehicle’s Odometer to be documented. Next, the Seller must define the accuracy of the Odometer. There will be two selections provided below the introductory statement for this purpose. If the Odometer is accurate and represents the actual mileage the vehicle has driven then place a mark on the first checkbox. The next portion of this form will consist of several blank lines, each calling for some defining information commonly used to identify a Vehicle. To start, report the Make, Body Style, and Year of the Vehicle in the appropriate areas. On the next line, report the Vehicle Model then, the Vehicle Identification Number (VIN). 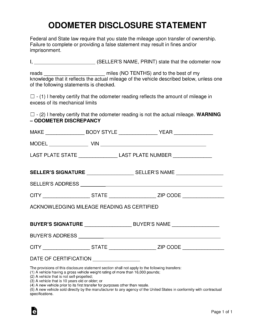 The individual selling the vehicle and reporting the Odometer information on this form must sign then print his or her name on the blank spaces labeled “Seller’s Signature” and “Seller’s Name” (respectively). The blank line below the signature line, “Seller’s Address,” must have the Seller’s Physical Street Address recorded (Building Number, Street, and any applicable Suite Number). The next line will have three blank spaces. Utilize these spaces to enter the “City,” “State,” and “Zip Code” associated with the Seller’s Street Address reported. The next portion of this form will require attention from the Buyer of the Vehicle. 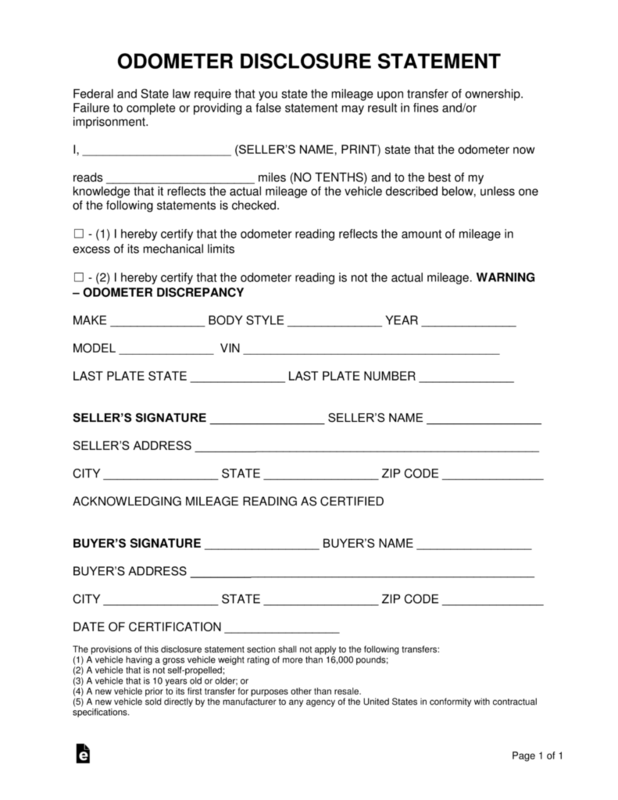 This portion should only be filled out once the Buyer has viewed the Odometer reading and reviewed this document. Once this task is completed the Buyer must sign his or her Name on the “Buyer’s Signature” line. Adjacent to this, on the space designated as “Buyer’s Name,” the Buyer’s Printed Name must be clearly displayed. Once this form has been completed, attach it to the Bill of Sale. This may not be required for every paperwork, however, such an action is widely considered a mark of good business.